3) 需求分析；BrownCow理論說明: 採用 Robertson夫婦所撰寫的Mastering the Requirements Process: Getting Requirements. 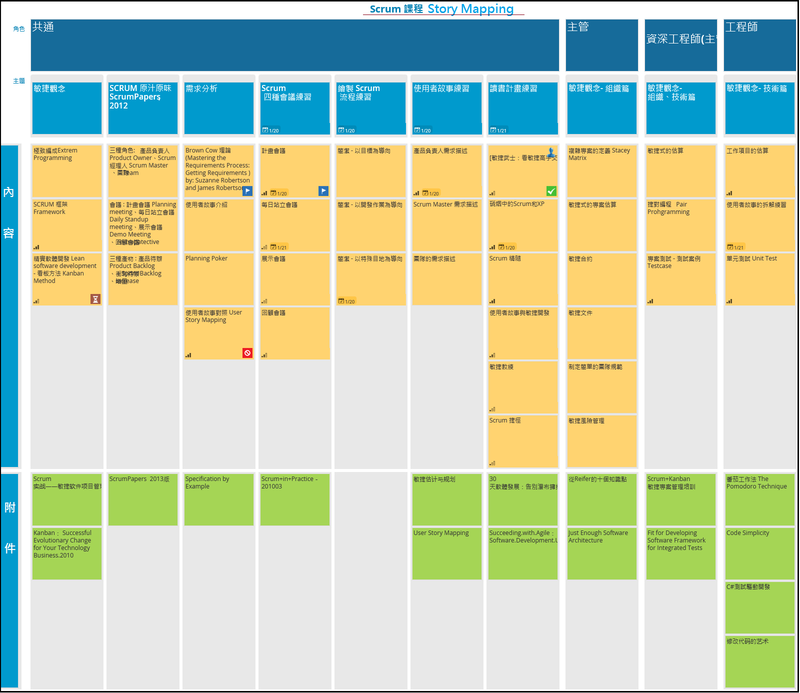 4) 召開Scrum四種會議的練習: Planning meeting/ Standup meeting/ Review meeting/ retrospective meeting. 1) 針對主管: 說明”從Reifer的十個知識點”及Just Enough Software Architecture. 2) 針對資深工程師:” Scrum+Kanban敏捷專案管理培訓” 加上“Fit for Developing Software Framework for Integrated Tests”. 3) 針對工程師: 番茄工作法 The Pomodoro Technique"，"Code Simplicity“,"C#測試驅動開發“,"修改代码的艺术"